Commemoration time again on these pages. Everyone in the radio world will associate the dates around the 14th August with the date in 1967 that the Labour Government introduced the Marine Offences Act designed to scupper the offshore pirate stations. It did, all bar one station that carried on the fight, Radio Caroline of course. But we are not going into the MOA here. Instead we commemorate the fact that it is 30 years ago, August 1983, since the new Radio Caroline ship, the Ross Revenge arrived in the North Sea. 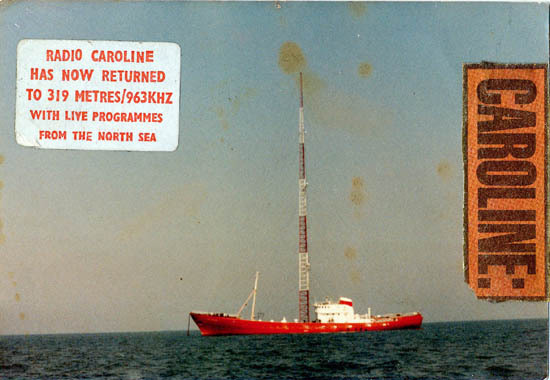 There had been rumour and counter rumour since the Mi Amigo sank in March 1980, (see my March page) about the triumphant return of Radio Caroline. I well remember that there seemed to be a lot of disbelief around though. "Believe it when I hear it" or "They cried wolf once too often", that kind of thing. 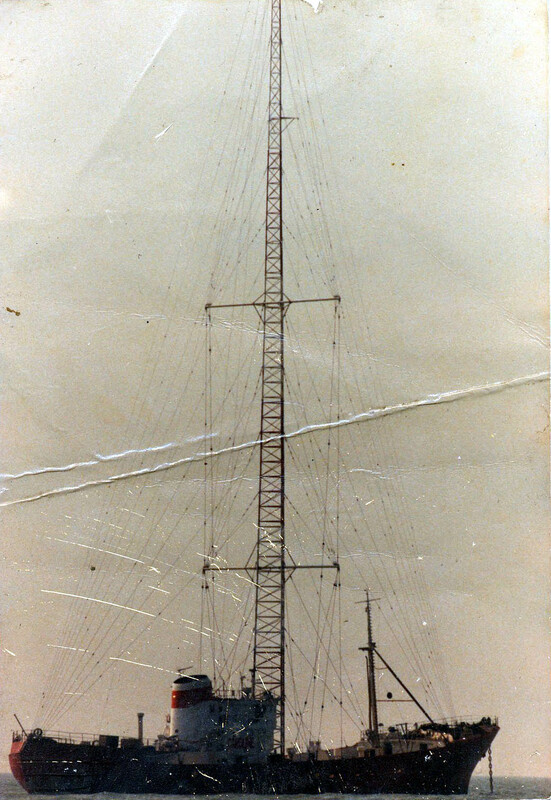 There had however been pictures of the ship seen in the anorak community, of a pinkish coloured Ross Revenge, with a very tall mast, and a portacabin on the deck, reputed to be for the studio, which would have given the presenters panoramic views of the sea. The photo collection I had seen was taken by Robin Ross, when he had been on board during the fitting out over in Spain. AUK used to sell these, after the Ross came to the North Sea, but we don't have a copy here unfortunately. I think I might have loved to be a fly on the wall when the final paper was signed and the ship was free to sail for the North Sea. The first we heard here was on Radio Nova from Dublin, on Wed 3rd August on the 1pm news. Tom Hardy made a few comments at the start of his afternoon show after the news, including the playing of "Do You Believe In Magic", and making reference to "Your All Day Music Station". Appropriate records were often played in those days. Remember that the guys at Radio Nova would have been in the know for sure at that time. They were unlikely to have deliberately blown any security by the report, if the ship had still been in harbour for example, though a later Dublin Today report did suggest it would sail the following day. I just feel the news should have been held back a day if that was the reality, just incase somehow the UK nobbled Spain NOT to let the ship sail under any circumstances. There was some kind of loyalty and honour code in those days, amongst radio folks that you don't see today. A few photos are shown with the giant tower, though I must admit, my own old manky prints are looking very tired.. lol. I don't even recall the source of these to give credit, but it was possibly Anoraks UK. There was an incredible feeling generated amongst the enthusiasts at that time. It seemed like it really was coming back!! There were a number of reporters hearing rock music on 963kHz. Album music was heard below Dunlaoire Local Radio which was heard with a test transmission on 3rd August at around 9pm. We can only assume here that they had heard the news and wished to pick up a few listeners on the back of that report of the Caroline ship sailing. The album music station we believe turned out to be Radio Jackie North from Liverpool also picking up a few listeners, ided on Saturday 13th August!! There was plenty TV coverage, which was a little premature, as there had not even been any tests heard by this time, and the chance to gain listeners from the TV reports perhaps was not as massive a deal as it could have been. But if the ship wasn't quite ready to broadcast, then it wasn't ready. Simple. Questions were asked amongst enthusiasts. Who would make the first announcement. That dubious honour went to Robin Ross during the first morning of musical test transmissions. And of course the infamous "I'm Tom" opening, that enthusiasts still talk about thirty years on, as being such a damp squib. There were no jingles for a long time after the station opened. It was the strangest thing. There was Radio Nova from Dublin leading the way, and cleaning up in Dublin, while Caroline came on the air with a "Hello Tom" format. That first night, I stayed out the pub on a Saturday night, just to listen to the station. The idea of having a radio ship back in the North Sea for Europeans was just great, and everyone I think and their granny was tuned in that night to hear how it was going to go. Tony Gareth from Dublin was on the air from 10 till midnight, and then at midnight, on he came, Dixie Peach. Phew!!! Dave Simmons, photographed in the papers prior to the relaunch, never made it on the air. The reason was unknown. See below for Daily Express Centre page. NB: I will hopefully be adding to this paragraph shortly, and it should find its way into the dxarchive section, rather than only being lost in the blog. 3rd AUGUST 1983 . . RADIO NOVA 1pm NEWS . . . 30 YEARS AGO!! 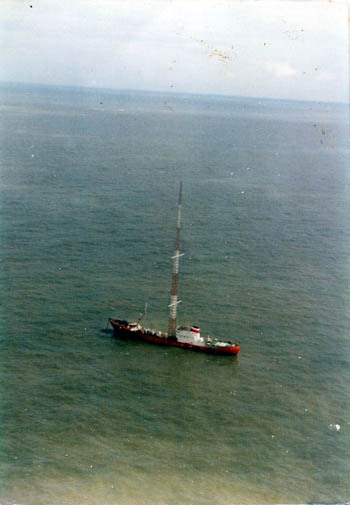 20th August 1983 . . . Radio Caroline 963kHz 1st now infamous "I'm Tom" announcement. That was it after 3 and a half years!! 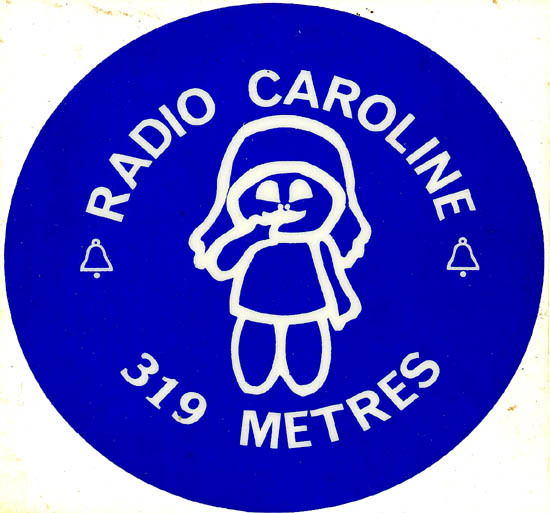 20th August 1983 . . . Radio Caroline 963kHz 1st ann recorded in SW Scotland. Not bad for mid summer (almost) at that distance. 3 PAGES OF CLIPPINGS, THE TIMES, NATIONAL "WHINGING" STUDENT, AND UNID. THIS STICKER WAS FROM THE 70s. THEY HAD NONE INITIALLY IN 1983! !